The search for the best pizza dough EVER has been going on for about a year. It began with Michael finally getting a Kitchenaid Mixer (something he’d wanted for years). 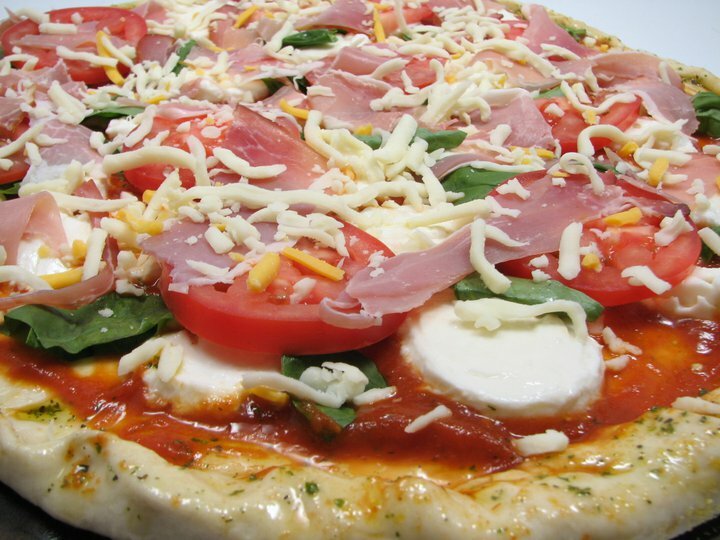 Over the year we’ve been making homemade pizzas, we’ve tried about 4 or 5 different recipes. Some were decent but nothing special, some were horrible. Recently we found one that is hands down the best dough recipe we’ve has so far. It was so good that we were both talking about the crust for a week while we enjoyed the leftovers! Even three days later, the pizza was amazing. While the mixer is running, add the water and 2 tablespoons of the oil and beat until the dough forms into a ball. If the dough is sticky, add additional flour, 1 tablespoon at a time, until the dough comes together in a solid ball. If the dough is too dry, add additional water, 1 tablespoon at a time. The only problem with this recipe is that it takes over an hour to do. My suggestion is to start it early and do other things. 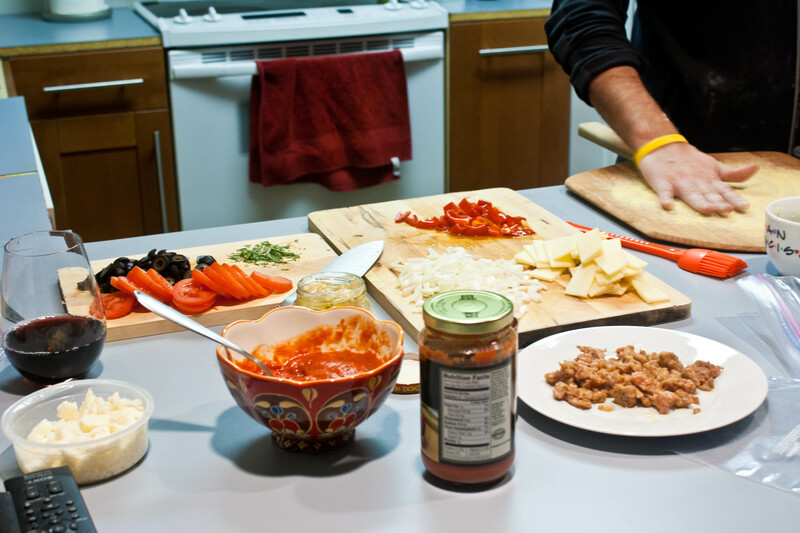 Or, if you are like me and slow in the kitchen, just prep all the toppings! The most recent version of the homemade pizza we made had several toppings. The first: sausage, hot peppers and black olives. The second: artichoke hearts, feta cheese, onions and tomatoes. 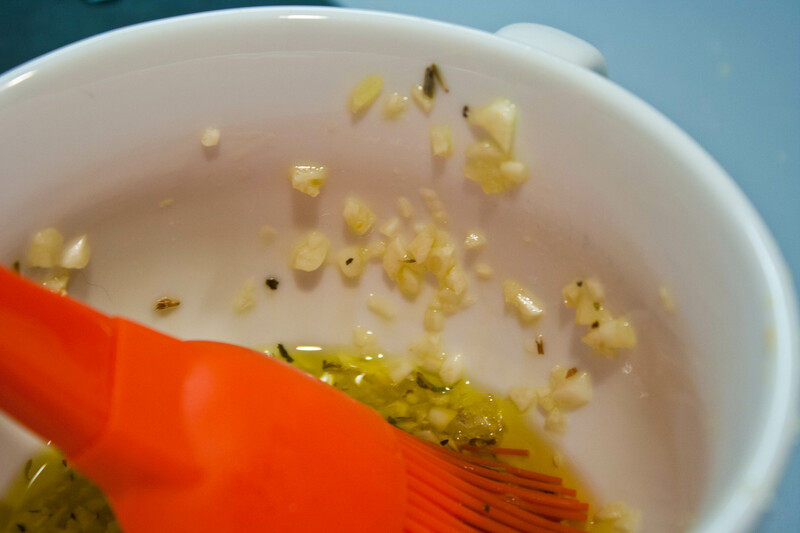 I like to add olive oil with minced garlic and herbs, a dash of salt and freshly chopped rosemary to naked dough after it’s been rolled out. I’m a garlic fanatic, so I tend to add tons of garlic to anything I can. 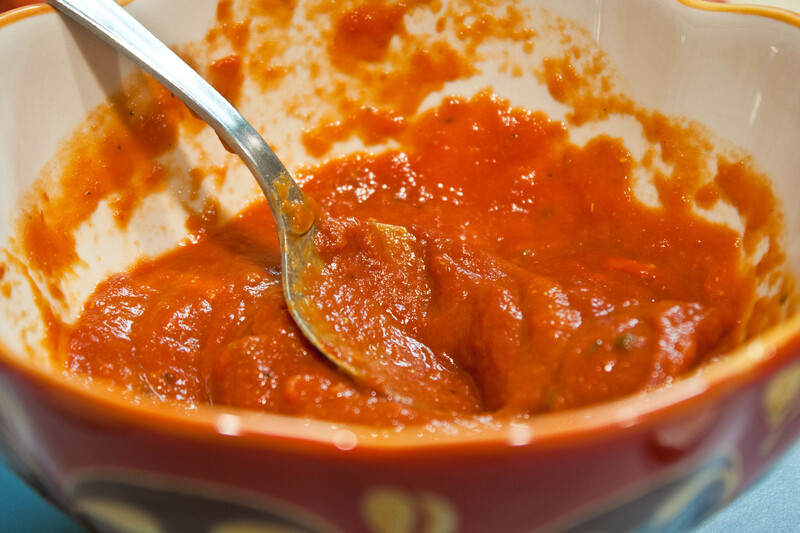 As for the sauce, I use either a jarred marinara sauce or a pizza sauce and I add some tomato paste to it to thicken it up. It’s really good. We usually bake the pizzas in the oven at 500 degrees but this time Michael tried it on the grill. It made the dough crunchier. They turned out so well! The pizza was delicious! This is definitely the dough recipe that we’ll use for awhile now. Each time we’ve tried it, it’s been successful and melt-in-your-mouth delicious. This recipe will be sticking around for awhile. 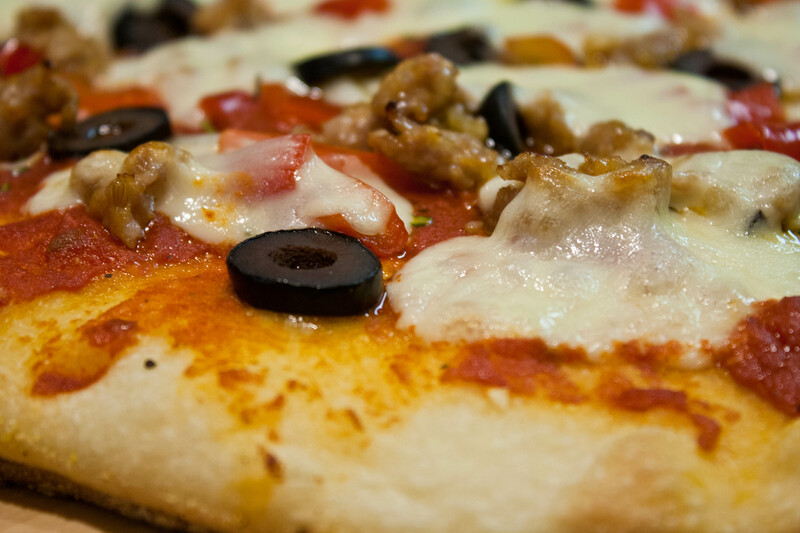 QUESTION: What’s your favorite pizza dough recipe? This looks amazing. I LOVE the idea of the herbed olive oil on the crust before the toppings. Thanks for the tip Lisa. Have a great Friday. That’s a trick I’ve been doing for awhile now and it makes a big difference. Have a good weekend! Did you use actual bread flour and if so do you think it made a difference? I’ve been debating getting some, I usually use whole wheat white flour for everything. 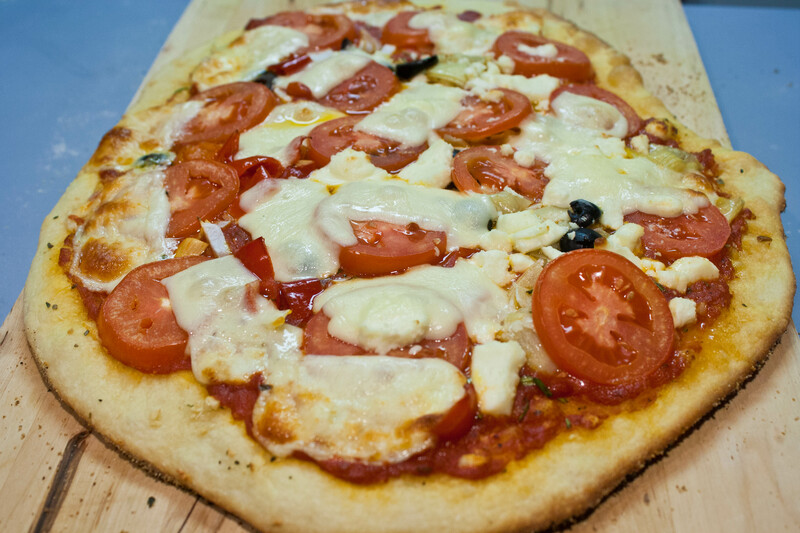 my favorite pizza dough uses bread flour as well- it’s amazing what a difference in texture it makes! This recipe was fantastic and I was glad we finally found one that worked so well.